The Sofame Steam Pump is a patent pending direct contact stack economizer which can be added to an existing boiler to improve the efficiency and lower (NOx) emissions by the humid combustion way. The Sofame Steam Pump solves a problem commonly encountered in power plants, where there is no heat sink that can absorb all the heat recovered from the boilers’ stacks. The Sofame Steam Pump creates an innovative discharge or heat sink for the energy recovered from the stack of an existing steam boiler. In many large boiler rooms, there is no industrial process or consistent year-round stream of water to heat. Consequently there is no heat sink for a condensing heat recovery system. The two columns of the Sofame Steam Pump recover the waste heat from the stacks and deliver it back to the gas burner via its flow of combustion air, making the existing boiler up to 98% efficient. The Sofame Steam Pump is mainly used in any application that uses a boiler. Maintenance is minimal. 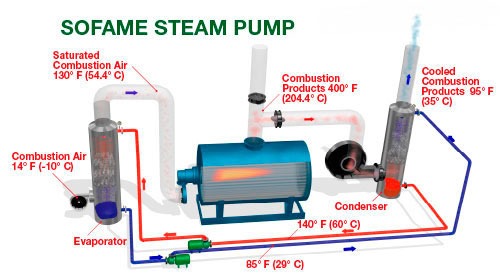 In regard to pollutants and green house gas emissions (GHG’s), the Sofame Steam Pump is of particular interest because it reduces production of nitrogen oxides (NOx) by lowering the flame temperature.